Today I am thankful for hair salons. 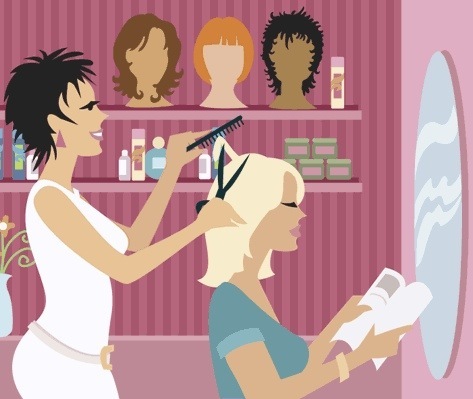 Now some of us might call them beauty salons, beauty shops, and maybe even a slew of other names, but no matter what we call them, I believe that we all know the wonderful benefits they provide. There are many things that I enjoy about my visits to the hair salon: participating in interesting and sometimes slightly off the wall conversations, the way that my hair looks and feels when it’s finished, and more. Yet, the thing that I enjoy the most about my visits to the hair salon is having my hair shampooed; that is by far the highlight of my visits. There is something absolutely wonderful and incomparable about leaning back in that shampoo chair and then feeling the warm water soak my hair as my stylist’s hands massage my scalp. And while she massages my scalp and cleans my hair I immediately sense the tension escape from my upper body as I relax and evict the cares of this world from my mind, if only for a moment. And what else do I do while my scalp and hair are receiving the much needed tender love and care that they deserve? I pray that my stylist will shampoo my hair at least one more time, that the special attention being given to my scalp and hair will continue for a little while longer. I do not know if the amazing way that my stylist shampoos my hair is simply something that she was taught in school or is merely an innate ability that she possesses, but whatever the case may be I am immensely thankful for it. And when she lets me know that it’s time for me to sit up so that she can comb my hair, I must admit that I feel a minute tinge of disappointment. The silver lining in all of this, though, is that at that moment I am a little bit closer to the time for my next visit to the hair salon.